Food: All living things need energy to do work and for growth and repair. They get this energy from the food. Our body uses this energy for doing work. Food Variety: We eat different varieties of food like rice, bread, vegetables, eggs, butter, sweets, cheese, etc. Ingredients of Food: Materials needed to prepare any food item are called ingredients. Two or more than two ingredients are needed to prepare a dish. Example: To prepare boiled rice, rice and water are used, so rice and water are the ingredients for boiled rice. 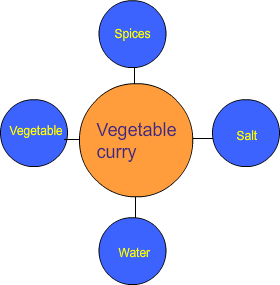 Vegetables, salt, water and spices are used in cooking vegetable curry, so vegetables, salt, water and spices are ingredients of vegetable curry. 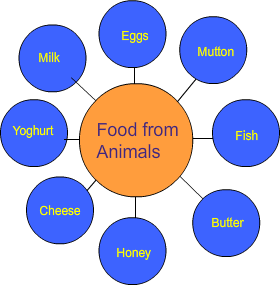 Plants and animals are the main sources of food. Food from plant source: Rice, wheat, vegetables, fruits, etc. are obtained from plant source. We get these ingredients from certain parts of different plants. Root: We eat root of radish, carrot, turnip, potato, sweet potato, beet, etc. Stem: In certain plants the stem grows underground and store the food. Ginger, potato, and onion are stems of plants in which food is stored. So, we eat stem of ginger, potato, onion, etc. Leaf: Spinach, Lettuce, Trigonella, etc. We eat leaves of these plants. Fruits: Guava, apple, banana, mango, papaya, orange, etc. We eat fruits of these plants. Oilseeds: Seeds of many plants are used to extract oil. For example Mustard oil is extracted from seeds of mustard plant. Similarly sunflower oil, coconut oil, groundnut oil, soyabean oil, etc. are obtained from seeds of respective plants. Sugar: We get sugar from sugarcane and beetroot. Tea & coffee: We use tea leaves and coffee beans. Spices: We get many spices from plants like - pepper, cardamon, ginger, turmeric, cloves, cumin, etc. We get milk, eggs, meat, honey, fish, etc. from animals. Buffaloes and cow give milk. Hen and duck give eggs. We get meat from goat, chicken, hen etc. Eggs and meat are rich in protein. Fish is the major part of food for people living in the coastal regions. Honey: Honeybee produces honey from nectar of flowers. It is rich in sugars, minerals and enzymes. Autotrophs: Plants make their food themselves by the process of photosynthesis so they are called autotrophs. Heterotrophs: Animals; including humans; do not make their food. They eat foods prepared by plants. Heterotrophs are divided into following types on the basis of their food habit. Herbivores: Animals which eat only grass and plant products are called herbivores. Cow, Elephant, Camel, Deer, Goat, etc. are examples of HERBIVORES. Carnivores: Animals which eat flesh of other animals are called carnivores. Lion, jackal, frog, tiger, lizard, snake, etc. are examples of CARNIVORES. 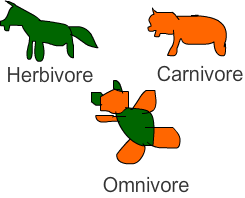 Omnivores: Animals which eat both plants and meat are called omnivores. Crow, monkey, bear, human, sparrow, etc. are examples of OMNIVORES. Scavengers: Some animals which eat flesh of dead animals are called SCAVENGERS.